Facing a win or go home scenario, Boston buckled down and defeated Washington on Sunday at the Verizon Center, 4-3 in overtime, and forced a seventh game in this particular Eastern Conference quarterfinals series. Tyler Seguin netted the game-winner at 3:17 in the extra session, and also recorded an assist in his team’s third postseason victory, while Andrew Ference, David Krejci and Rich Peverley each potted a goal for Boston. How The Game Was Won: The Bruins earned a 3-2 lead midway through the third period before the Capitals evened the score with an Alex Ovechkin tally at 15:08, which prompted an extra session. In the fourth frame, Boston earned their second overtime victory of the series on their third strike by Seguin, who managed to weave past Washington’s netminder Braden Holtby, (27 saves) for the clincher. Seguin’s Goal Cracked Holtby: With a chance to help his team punch their ticket to the Eastern Conference semi-finals, Washington’s 22-year-old netminder deflected two shots by Boston in overtime, but couldn’t contain their third, as Seguin snuck the puck past Holtby for the game-winning goal. Seguin’s strike propelled an animated postgame celebration on the ice, and pushed the momentum arrow toward Boston. It also exhibited that Holtby isn’t comfortable with traffic in front of the net, too. Holtby has been rather impressive against Boston, but one might wonder, will he be able to rebound on Wednesday? Two-Goal First Period: Entering Sunday’s afternoon affair, Boston had won 16 contests when they scored two or more goals in the first period. Against the Capitals, the Bruins ended the opening period with a 2-1 lead, and wound up beating their first round foe by one goal. Boston is now 17-0-0 when notching two or more tallies in the opening frame. Game No. 7: Last season, Boston won two consecutive game sevens, and will attempt to earn their first of the 2012 playoffs on Wednesday. It’s Friday, wahoo! Here are some headlines and news to kick-start the final day of the workweek, enjoy! 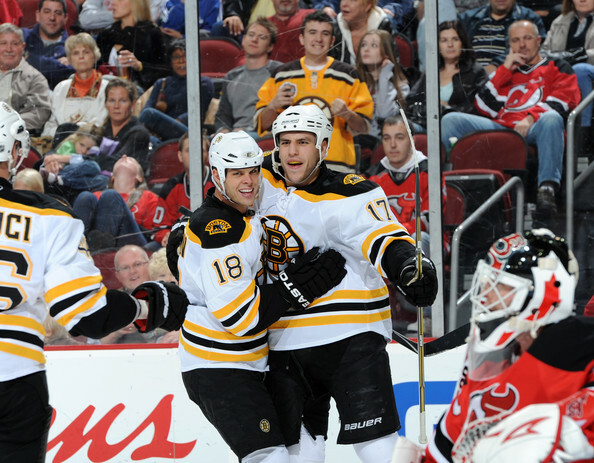 * The Boston Bruin ended their four-game road trip with a 2-2 record, as they defeated the New Jersey Devils, 4-1. The Black and Gold notched four goals in the third period, as Andrew Ference, Nathan Horton, Gregory Campbell and Chris Kelly all scored for Boston, while Tim Thomas deflected 30 saves between the pipes. Boston will return to the ice on Saturday afternoon when they host the New York Rangers at the TD Garden. * Boston Celtics President of Operations Danny Ainge told WEEI, (Boston Sports Radio) on Thursday that he was stating the obvious about dealing the “Big-3.” Although, he did admit if there is a decent deal on the table, he’ll most likely pull the trigger. * Rajon Rondo told the media on Thursday that he’s doubtful for Friday’s contest against the Phoenix Suns, which means Avery Bradley, will most likely be the starting guard. * According to various reports – the New England Patriots are “believed” to be the AFC foe that’ll face the St. Louis Rams next year in London, England. The Patriots last played overseas in 2009 when they defeated the Tampa Bay Buccaneers. BOSTON, MA — After an eventful first period, Gregory Campbell extended the Bruins lead when he netted his third goal of the season at 3:50. Campbell’s goal was assisted by Brad Marchand, (one goal, two assists), and Andrew Ference, who recorded his fourth consecutive assist. Florida then attempted to respond with five consecutive shots, but Tuukka Rask, (18 saves) denied the Panthers offense before they watched Patrice Bergeron, (one goal, two assists) chip in his seventh goal of the season to give the Bruins a 6-0 advantage after two periods.